For the last few weeks I've been pinning Halloween ideas for the BritMums Pinterest board (you can see some of them here on the Kids Party Ideas board) and it got me thinking about how much my children would love a Halloween party. I didn't fancy the idea of inviting loads of people, but I have a friend with similarly aged children that we see regularly, and so with an empty half-term to fill I invited them around for a small Halloween party towards the end of the week. The children were really excited, and I came up with lots of things that we could get ready in advance, so we had plenty of crafts and activities that kept us busy for several days! I have a small stash of Halloween decorations already that have been collected over the years. So we had some hanging pop up decorations, light up balloons and so on, as well as some of our own homemade decorations like the Hama bead witches and Halloween tree. I also bought some cheap black bin bags and we cut them up in strips and taped them across the tops of the living room door. 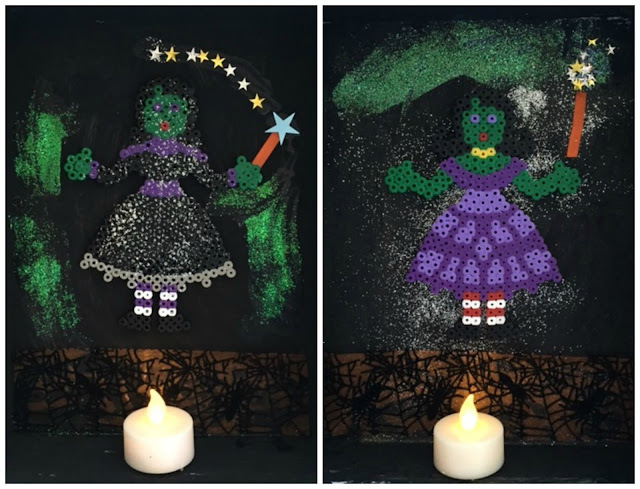 For the windows you could make some really simple spooky window pictures, a great craft that even little ones can help out with and so easy that you can make them to cover as many windows as you like! Our first activity was to decorate gift bags for trick or treating. I found some plain bags in the party aisle at Asda and then printed out some suitable pictures from Twinkl - Halloween Size Ordering pictures (Twinkl subscriber resource) - for them to cut out and stick to the bags along with their own drawings. Then we went trick or treating! I made a sign in PicMonkey to put at the bottom of the stairs, then we set up six Teddy Trick or Treating stations around the top floors of the house. We made doors from cardboard painted brown, and each one had a number on it. Then each 'house' was occupied by a teddy with a bowl of sweets which were all numbered the same, with one in each bowl for each child. The children had to find and visit each house, and take a sweet from each teddy. Decorating biscuits is always a fun activity for parties. I made the gingerbread biscuits in advance using a variety of Halloween themed cookie cutters, then just laid them out with some coloured icing and a selection of Halloween sprinkles (found in Asda) for them to have fun with. Inspired by these Halloween photo booth props we made up some of our own so that the children could take turns posing for silly photographs. I loved this super simple Feed the Monster game and so we made our own, ready with a selection of soft food from the play kitchen (you can spot my felt party rings!) for the children to try and throw into his mouth. In the morning we made some cupcakes which I decorated with orange icing and some cupcake toppers that I printed out. I found them linked from here - Halloween cupcake topper freebies. They are just cut out and taped to cocktail sticks. Then I just did the usual kids party food, but the children helped me to come up with suitable names for it, e.g. chocolate fingers became broomsticks, mini breadsticks became bones, carrot and cucumber sticks became fingers and little crisps were fingernails. I made labels for the food using PicMonkey and made little stands for the labels using Duplo to place around the food. 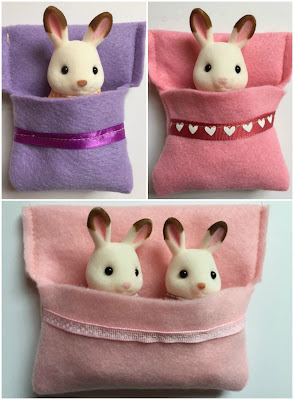 Knowing how much she loves putting her dolls and teddies to bed, I sewed up some really simple felt sleeping bags for her rabbit family. I love crafting with felt because you don't need to worry about hems, and because it is stretchy it fits snugly around the bumpy figures. These sleeping bags are really simple to make, and even though I made them with a sewing machine it wouldn't take long at all to sew them up by hand. I made two adult sleeping bags and a double one for the children bunnies. 2 - Turn the piece of felt over. On the side with the ribbon fold up about 8cm (the height of the figure up to the neck). On the other side fold over the top of the felt to form the first part of the pillow. 3 - Fold it over once more so that it is three pieces of felt thick. 4 - Sew down the sides. 5 - Trim the edges so that they are neat then fold it out the right way. Trim around the sides of the pillow so that it doesn't stick out too much. 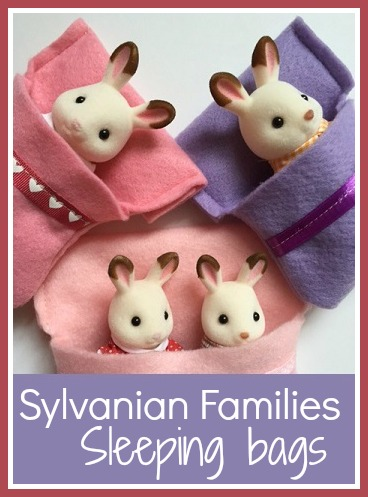 Of course you'll need to make a sleeping bag for each member of the family! We received the Chocolate Rabbit Family as Friends of Sylvanian Families. I few weeks back I published a post about Pinterest Wins, where I shared some amazing things that people had made or done, all inspired by Pinterest, that turned out brilliantly. 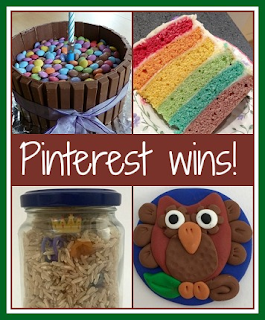 I had so many to share that there was no space to share any of my own Pinterest wins! So here are some of the things that I've made thanks to Pinterest, and that I was really proud of. One of the very first new ideas that I encountered when I first started browsing around Pinterest was the classic Kit Kat and Smarties cake and it was one of the first things that I pinned. I attempted my own version almost immediately for a birthday cake, and I was so pleased with it! You can read more about it here - Pinterest cake - the one with Kit Kats and Smarties. Fuelled by my success, I went on to attempt another Pinterest classic - the Rainbow cake. It was a great success, and introduced me to gel food colourings which have produced an array of brightly coloured birthday cakes ever since! I must get around to making another one. You can read how I made it here - My Rainbow Cake. Finally, another cake that I'd seen everywhere was the piñata cake. My version was very well received, and I've made several more since. It's really easy to do! Here's how I made mine - How to make a simple Pinata Cake. It was so easy to put together and the children still enjoy playing with it years later, they love it. You can read about how I made it here - I Spy Jar. I found it easy to make my own version, which made a lovely magnet. You can read more about it here - Fimo Owl. Pinterest has also been full of inspiration when it comes to sewing projects, something that I've taken up again recently. I was really pleased with how easy I found it to follow the simple pattern, and the little dress fitted our doll perfectly! You can read how I made it and find a link to the pattern here - Sewing a simple doll's dress. These are just my favourite Pinterest inspired wins, there have been many more and hopefully I'll continue to make more Pinterest inspired creations! What are your Pinterest wins? I've always liked Shakespeare's Hamlet. I studied it in some depth at A-Level, and even though that was longer ago than I care to admit I can still remember it pretty well. I wasn't on the ball enough to think about getting tickets to see David Tennant in Hamlet a few years back (I was also around 37 weeks pregnant with Harry when it was on) so when Hamlet with Benedict Cumberbatch was announced well over a year ago I was very keen to try and get tickets. It was a bit of a mission involving an entire morning along with multiple computers and mobile devices, but Ram came through in the end with a pair of tickets, and it just so happened that they were on my birthday which was a few days ago. So we booked our babysitters (my loyal parents) well in advance and Ram and I headed off for an exciting day out. We didn't really have any plans for the rest of the day, although we were fortuitously in the right place to book Star Wars tickets for Ram and Harry in person at the BFI Imax in Waterloo on a day that the computer booking systems had crashed. We had a nice lunch at Franco Mance (sourdough pizza, yum! ), then spent a lot of the day just wandering about, which suited me perfectly as I love walking around London. We visited Hamleys, popped into the Museum of London and stopped for a sit down and a hot chocolate (a reminder that we are getting older and can't handle as much walking as we used to). Then we arrived at the Barbican nice and early and found somewhere to sit and eat our sweets. I'm not very good at writing detailed reviews of shows, so I'll just say that I enjoyed it very much. We had excellent seats in the centre of the fifth row, so we had a great view. The play was quite long but it didn't feel it, it was very dark and intensive with an explosive end to the first half that left us showered in pieces of black paper that are still emerging from clothing days later! Benedict Cumberbatch is an excellent actor, and you could see how much work he was putting in, and he seemed very emotional at the end. It was a brilliant production, and I wish that I could watch it again and again! The play was filmed for cinemas last week, so I'm hoping that there will be a version available to buy on DVD at some point. I haven't decided if this birthday beats my 7th birthday when I received the My Little Pony Dream Castle, but it's definitely going to be hard to improve on it next year! Recently we were sent the Hot Wheels Nitro Bot Attack Track Set from Hot Wheels to review. Harry is a huge fan of Hot Wheels, and he's lucky enough to own several sets. The Hot Wheels toys are also great for both children to play with together. Harry enjoys the actual moving of the cars around the tracks and Mia likes building Hot Wheels cities, accessorising the layouts with little buildings and gardens that she's made with Duplo. They can spend ages constructing Hot Wheels City in the living room, and Harry also enjoys watching the Team Hotwheels film which features the Nitrobot robot. The Nitrobot is a giant robot made out of cars. He's attacking the city, capturing cars and ripping up the road. The only way to stop him is to launch a car directly at him and cause his head to fly off. There are three slots at the base of the set where you can attach a launcher (one is included in the set) and firing out a car causes a variety of different things to happen. One launch point will send the car flying around the bend, and you can adjust the track to make it avoid the robot. The middle launch point will drop the ramp, and if it's already down it will hit the robot in his chest. The final launch point will send the car around the other way. If you fire the car up the ramp so that it hits the purple button on the robot's chest, the head of the robot will fly off and any cars which he is holding in his hand will be released. If you send the car underneath his hand then the robot will tear up the road. As well as the launch point you can also attach spare track that you might have from other sets at the base to extend the layout. The set only comes with one car, although most other cars of that size are compatible with it. A big plus for this set is that it doesn't need any batteries. It's also fairly compact (although once built you can't take it apart again), and compared to some of the other Hot Wheels sets that I've put together I found it easy and straightforward to assemble. Like many other Hot Wheels sets, this one is a lot more fun if you have other track and accessories that you can combine with it, but it does also work well as a standalone toy. If you do have other launchers you can connect them at the front so you don't need to keep moving the one that is included about, and you can easily extend the track from all three launch points so that Nitrobot can become part of wider Hot Wheels play. We received this Hot Wheels set in exchange for a review. 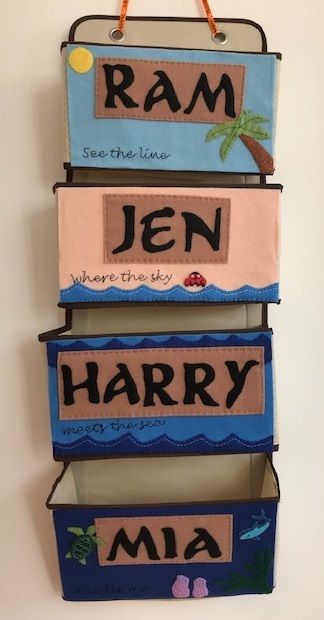 I very much look forward to our monthly Bostik Bloggers themed crafting box, it always contains some gorgeous bits and pieces which inspire me to come up with lots of crafts for us to do together! This month we started with an Autumn craft - an Autumn themed wreath decoration. I had a vague idea of how the finished craft would look, and I sat down with Harry to start him off. Unfortunately Mia then decided to throw a massive tantrum and so I was occupied with her. Fortunately Harry was happy to get on with his crafting and came up with his own interpretation on the wreath using a fair bit of sellotape, and I think he did an awesome job! Cut out the centre from the paper plate to make your base wreath. Glue the fake leaves around the wreath. We used Bostik Glu Dots which we've found to stick all sorts of things really well. Then add further decorations, we used buttons. I'd intended for the buttons to also go around the edges of the wreath, but Harry decided to use sellotape across the centre to display them! Attach a pipecleaner loop firmly to the back of the paper plate using tape. Cut out the centres from the paper plates and use the ring as a template for a Halloween or spooky themed drawing on the tracing paper using felt tip pens. Cut out your picture and secure it to the back of the paper plate circle using tape. Use Bostik Glu Dots to stick the other decorations around the frame. Once again, the Glu Dots worked brilliantly for adhering all different types of materials, I'm particularly impressed with how well they stick down pom poms which I've always found difficult to craft with. Create a hanging loop using ric rac or sellotape and tape it firmly to the back of the decoration. Hang in a window and enjoy! Last year I blogged about the Hama bead witches that I made for Halloween, using the princess pegboard. I was really pleased with them, and when I was sorting out the Halloween decorations to put out this year I thought it would be nice to come up with a better way to display them than just having them sitting around. So each child used a shoebox lid to make a standing display for their favourite witch. First we painted the shoebox lids black and added some glitter paint and glitter while the paint was still wet. Then we stuck the Hama bead witches in using some foam pads so that they were raised slightly from the background. The children decorated inside the boxes using sequins and bits of Halloween spider ribbon. When it was dry we popped a battery powered tealight in the bottom to make light up decorations (obviously these decorations aren't safe to use with real tea lights!). Now that here in England we are being charged 5p for bags in the supermarket, have you been caught out yet? The first time I went shopping after the charge was introduced I left my bags in the car and had to abandon my trolley (this was before I'd paid) and run back to the car for my reusable bags, I don't intend ever paying for a carrier bag! With excellent timing I was asked to review some Trolley Bags (affiliate link)- reusable shopping bags which fit inside your supermarket trolley. They are available in two different sizes for both large and shallow trolleys and they roll up neatly for storage. We've been trying out a set of the large bags. We usually carry out one large shop per week, and perhaps here I should confess that this job is normally left to my husband, and then I end up doing a small top up shop at some point during the week. So at the weekend I sent my husband off to our local supermarket with the bags to see how he got on. While you are doing your shopping, the trolley bag roll fits neatly onto the hook at the front of the trolley. Of course if you are in a supermarket where you can scan and pack as you shop then you can start to pack directly into the bags straight away. Then when you have unloaded your shopping onto the conveyor belt, you can prepare your trolley by opening up the bags and easily sliding them out to fill up the trolley. There are four separate shopping bags, each held together with velcro on the handles. They range in size to match the shape of the trolley. Now you can load in your shopping! Having the four separate compartments is really useful as you can sort out your items to give you a head start when it comes to putting it away at home. The largest bag is really good for bulky items as it has a huge capacity (there are two big multi packs of toilet rolls stacked in there). If you aren't buying a full trolley worth of food you could always just use a couple of the smaller bags, although only the largest bag has the strap to roll all the bags up with. Then when you get the trolley to the car, you can easily separate the bags and load them into the boot. They are quite large when filled with purchases as they have a netted section at the bottom which makes them very deep, so you do need to careful not to overload them, especially the largest ones, as they can then be a little awkward to lift up high enough to get them out the trolley. When you've put all the shopping away it's easy to fold and roll the bags back up ready to store in the car for your next trip. We've been really impressed with the Trolley Bags and would definitely recommend them. Trolley bags are also available in an Express size to fit smaller trolleys, great for when you are just doing a quick top up shop. You can read my review here - Express Trolley Bags. We received a set of trolley bags in exchange for this review. Amazon links are affiliate. As I mentioned in my previous post about learning to crochet, for the next six weeks I am going to be taking part in the first ever Patons Crochet Along. I'm really excited to be joining in and creating a beautiful Afghan by the end of November. The crochet along started on the 9th October 2015, and different pattern elements will be released each week on social media and the Make it Coats website. The complete pattern will appear on Make it Coats on the 20th November 2015, so there is plenty of time to get it finished by Christmas! The pattern is suitable for both beginners and more advanced crocheters, and each week there will be a tutorial video for that section of the afghan. I must admit to feeling a little daunted when the box turned up filled with yarn, but I am so determined to really get the hang of crochet this time, and doing the project as part of a crochet along is the perfect motivation that I need - I'm very good at working to a deadline and there will be no excuses not to get on with it! The yarn used for the afghan is Patons Wool DK in five gorgeous colours - Plum, Pink, Natural, Mint Ice Cream and Merlot. Having never followed a crochet pattern before I knew that I'd need help and so I turned to my Mum. She was able to help me visualise how the pattern description related to the finished triangle and she'd soon shown me how to get started. We worked on this part of the pattern together while I'm still learning, and so there is a fair bit of her work in these triangles. But I've really noticed how much I've improved with the work that I've done on them, so I'm hoping that the finished afghan will be mainly my own work! I'm really pleased with the triangles that we've made so far, and the colour combination is lovely. I have been sent the yarn needed to complete the project in exchange for sharing my progress with the Afghan across social media. Harry brings home a few bits of homework every week but Mia doesn't have any apart from her reading, and despite me assuring her that she has many years of homework ahead of her, she's always asking for something that she can do while Harry gets on with his. With Autumn most definitely in the air, I had a look at the Twinkl website for some Autumn themed resources that would be suitable for her as she begins her schooling in Reception. At our recent parents evening her teacher suggested that she needs a bit of help with number recognition, so I printed out a set of these Autumn Leaf Numbers (free download). They are A4 sized, but I printed them at 50% and laminated them to make smaller number leaves. To begin with we just used the numbers 0 - 10 and we played various games with them - I hid them around the living room and asked her to name each number in turn as she brought it to me, we put them in the right order and I took away numbers from small sequences and asked her which one was missing. I think it really helped her to have something tactile to hold and play with! When we've finished playing I'm going to stick them up in her bedroom so we can look at them together while she's getting ready and I'm brushing her hair. While I had the laminator out, I also laminated each child an Autumn Tree Playdough Mat (Twinkl subscriber resource). Both children love play dough and I really love the Twinkl range of play dough mats, making specific shapes is great for their fine motor skills and finger muscles, especially making the little leaves. Harry found a piece of textured Lego that was the perfect size and shape to make the veins on the leaves, and he spent ages on this. Another thing that we need to work on with Mia is her pencil grip. Although she does lots of colouring, drawing and writing, she doesn't hold her pencil properly and so it's something that we need to practice. Activities like this Autumn Shadow Matching Worksheet (Twinkl subscriber resource) are great for her because they are quick, simple and fun. She was so pleased with herself when she correctly matched the shapes. We also practiced her cutting skills with an Autumn Leaf Sequencing Worksheet (Twinkl subscriber resource). She found it a little challenging to work out which leaf shape should come next so she just chose her favourite one to stick in the box! Both children then had a go at some Symmetrical Leaf Drawing Templates (free download) which require them to complete the second half of a leaf shape and then colour it in, and even Mia managed a good go at this. I really do love Twinkl resources, it's great to be able to print out a couple of things during the day for the children to get on with after school and there are so many different themes that I can always find something that will interest them or that fits in with the topics that they are learning about at school. I have been given a Premium subscription to Twinkl but I am under no obligation to write about them, I just like to share their resources because I think they are brilliant! Frank Einstein and the Brainturbo by Jon Scieszka and illustrated by Brian Biggs is the third book in the best selling Frank Einstein series. Frank Einstein is a kid-genius, scientist and inventor, and along with his best friend Watson and Klink (a self-assembled artificial-intelligence entity) and Klank (a mostly self-assembled and artificial almost intelligence entity) they once again find themselves in competition with T. Edison, their classmate and arch-rival. This time they are trying to unlock the power behind the science of the human body. The book is packed full of drawings and illustrations that bring the science behind the story to life. There are experiments to carry out that relate to what is going on in the story. For example, when the characters are trying to improve on the design of the human body there are some little experiments that you can do to find out more about how your body works, like making a cone out of paper to improve your hearing or finding out where your nerve cells are closer together. At the end of the book is a well-written and accessible chapter which summarises some of the key facts that have been touched upon during the story, like the different systems in the body. I found the book quite difficult to read aloud to Harry as it's quite chaotic and fast moving! But I'm not the target audience for the book and I think it will really appeal to him, so I'm going to put it aside until he's confident enough to read it for himself. I know that it's definitely going to appeal to his love of all things science, and the writing style is going to impart a lot of scientific knowledge in a fun way!